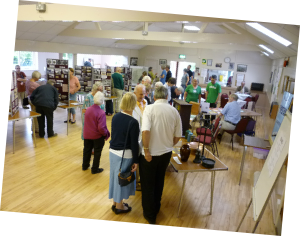 We returned to Rickinghall Village Hall for our fifth annual event and we were delighted to welcome a whole host of local residents, young and old. 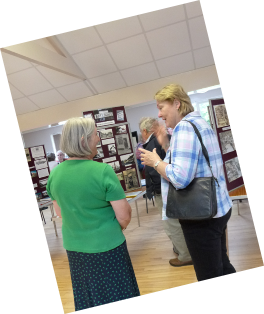 Many friends travelled from further afield to catch up with local history happenings and to meet up with extended family and old school friends and acquaintances. 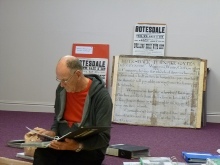 Sue Emerson gave a talk paying tribute to local historian, Brian Chandler, who died earlier in the year. At this event we launched the fourteenth book in our local history series. Shops and Shopping was researched and written by Graham Clayton. Graham also gave a talk to mark the launch which focussed on the fascinating history of one of Rickinghall’s oldest shops - now a private residence - Elm Cottage. 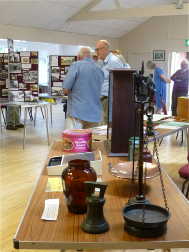 As ever, people stayed for hours poring of the displays of old photographs, documents and memorabilia about our villages. Some brought their own photos of the neighbourhood to share with us.